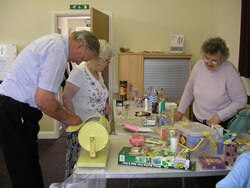 The Friendship Group held a charity Coffee Morning in the Recreation Room on Saturday 23rd May 2009. This was their first fundraising event of the year held in support of their chosen charity Five Villages First Responders. There were all the usual stalls of cakes (which went very quickly!) bric a brac and books, as well as a tombola and a raffle with many wonderful prizes. 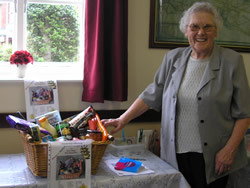 There was also a raffle for a large hamper of goodies, kindly donated by Kath Whitcomb. The raffles were drawn by Mr Colin Gibson who is a responder himself. The weather was glorious and tables and chairs were set up outside so people could enjoy the sunshine whilst partaking of the refreshments of tea, coffee and biscuits which were available. The event was well attended and raised the sum of £500. Grateful thanks go to all who supported and who were involved in organising the event.